Golf bets are common after football bets. Many bookmakers have included golf in the bets and pundits are making money through such bets. It is possible to consistently make money through golf bets through identifying good betting values and placing calculates stakes in the games. For a newbie, the information on the internet today might be overwhelming, and you might end up confused. 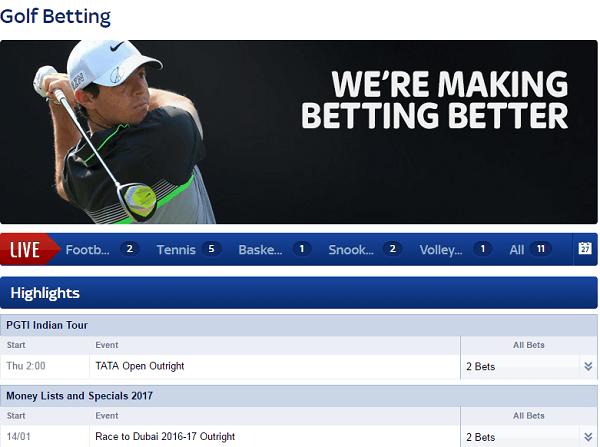 The number of betting options available in golf betting alone is many, and there are many markets involved at the SkyBet golf betting site. This guide will simplify your research on the essential details that you need to know concerning golf betting. There are two main golf tournaments that you can bet on the SkyBet Golf bookmaker. The first tournament is known as the PGA Tour. This tournament is played in the US, and other supporting events take part in Asia and South America. Most players who take part in PGA Tour are born in American. The best players worldwide love to participate in the PGA Tour as it gives them the highest-ranking points in the world as well as a good prize. The second tournament is known as the European Tour (ET). This takes place across the Europe Continent, Southern Africa, and Asia. A good number of The ET events are held alongside Sunshine Tours and the Asian. This gives various tournament fields an international touch like the 2016 ET season that saw the tournament take place across 26 countries. At the end of each tour, the most successful players in the entire season come together in reduced field events known as Race to Dubai on the ET and Fed-Ex Cup in PGA Tour and compete for a good prize of cash. The Fed-Ex Cup happens in over four events, the first that sees the top 125 players participate. In the second and third the number reduces to 100 and 70 respectively. The fourth event, which is the final one has only the top 30 players on PGA Tour participating. The winner here carries a hefty bag of money home. More than 140 players take part in the golf tournaments, and this translates to massive prices for the golf punters. There are players who win with consistency and betting on them will earn you some cash. At the bookmakers’ sites, the rating of a player might improve, and it can work out in your favour in one way or another. 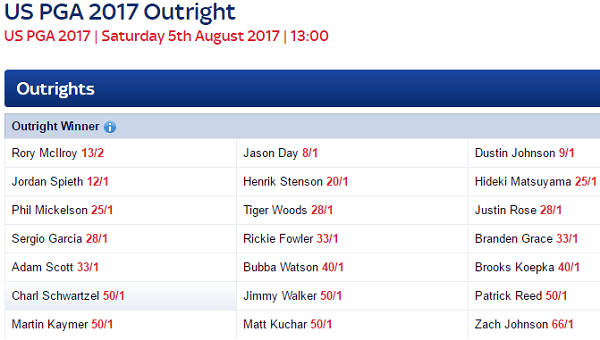 At the SkyBet golf site, is a player is listed with odds of 34.0 then that odd simply represents the likelihood of that player to win the tournament. This odd is also equivalent to 2.94% likelihood to win the tournament. Understanding how the probability works is a key ingredient to becoming a successful punter. For long term purposes, the key is to understand the value of the bets and only place bets when there is a value addition. Always be value-minded as betting without will lead to losses all along. To determine the value of the bet is a simple calculation. For instance, when the odds of a player to win the Masters are 8.0 then having done your research and found, that there is a 15% chance, that the player will win then the value is calculated as the product of the decimal odds and the accessed probability less one. This implies that the value of the bet with the 15% chance to win is 8.0*0.15) - 1= 0.20. At any instance, when calculating the value of the bet, the value should be greater than zero, and it is known as a value bet. A punter who looks forward to making profits then they should focus on making more accurate assessments than those presented by the betting sites. To improve your chances of identifying the value bets then you need to specialise. Always go for sports and tournaments that you are familiar with. After learning how to identify value bets then you will be in a position to join other leagues and tournaments to bet. Understanding the probabilities will also improve your chances of identifying value bets. Value bets will have low odds as the players are likely to win the tournament. Set personal odds for upcoming tournaments by looking at the fixtures. This technique will also improve your odds of betting on a value bet. Below are some of the ways through which you can bet on golf: betting on the tournament winner is a way that you can bet on golf. In this case, one will back an outright winner of the tournament with a single bet. When the player loses then, you will have lost the bet. You can also bet an each way bet. This bet means backing a player to win the tournament and then specifying the position with a single bet. 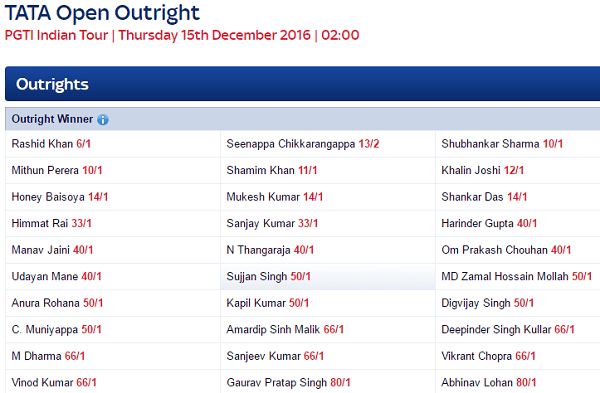 The bookmakers also offer the first round leader bets. This is a favourable bet as your player will tee off when the conditions are promising. This type of bet has proven to be profitable on a long term basis. It is also favourable for players who might not be able to succumb to the pressures of Sunday back-nine. Another bet allowed in golf is the top 10, top 20 finish bets. In this bets, you will have to back the golfers who will finish at the top 10 or top 20 and when they do then you win the bet. You can also match the bets in golf. This implies placing bets on outcomes like who will score three balls group or who will have the lowest score. It is a matchup between two players. Finally, the casinos also offer the hole in one bet. This bet implies backing the chance that there will be a hole in one shot at the tournament. Always go for bets that you can afford just like you have indicated in your bankroll. Do not be tempted to include the winnings into the game and practice responsible gambling.